"I used to skip finance and go to ballet," Maurice E. Parent laughs as we talked about his journey from Business School at Carnegie Mellon University to the stage - where he has found considerable success acting and performing. His current role is Tom Collins in New Rep’s upcoming production of "Rent." Maurice, like many actors whom I have spoken with in the past, knew he wanted to perform at a very young age. He was just in 4th grade when the upper class performed "Music Man" for the younger kids - he knew then that he wanted to be a part of the theatre world. 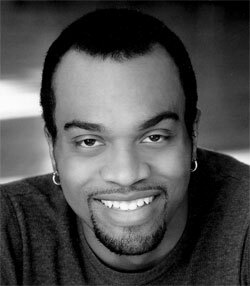 Maurice E. Parent is an all-around performer - he sings, dances, and acts; amongst his favorite roles is Belize/Mr. Lies in "Angels in America" (for which he won an Elliot Norton Award). Other credits such as "Man of La Mancha," "Midsummer Night’s Dream," "King John" and "Hair" are but a few on his long list of memorable performances. Parent is no stranger to the New Repertory stage with past roles such as "Passing Strange," "Cabaret," and "Ragtime" ( IRNE Nomination). 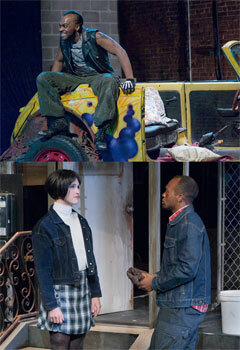 Maurice was working on Passing Strange when he was offered the opportunity to play Angel, the HIV+ drag queen, in "Rent." Although, he was thrilled, he knew Angel’s songs were vocally too high for his voice range. However, he is extremely excited to have the opportunity to play Tom Collins - the brilliant computer hacker (also HIV+) who take up with Angel. His excitement has paid off with some glowing reviews, such as the one from this publication. "Parent (who last stole scenes at New Rep in ’Passing Strange’) is spot on as the anarchist philosopher Collins. Vocally his rich voice purrs through ’Santa Fe’ and is joyful when declaring his love for Angel in ’I’ll Cover You.’ He also shows range as an actor, from clowning around as an ersatz James Bond to expressing quiet dignity in the face of the second act’s sorrows." Why did he pursue the role? He goes on to talk about how when the audience is first introduced to Tom Collins, the character had just gotten jumped and is experiencing personal struggles financially and with his health. Throughout the play, there is growth - each character experiences along with a message around living life to the fullest and cherishing every moment. Maurice enjoys playing roles that are challenging and allow him to display his range of capabilities. He mentions his respect and admiration for actors like Cuba Gooding, Jr. and Laurence Fishburne - who are known for their virtuosity of acting abilities and range of believable roles. Fortunately, with the help of the great mentors throughout Maurice’s life (such as his vocal coach who helped to re-shape his voice, his dance teacher in college, and great cast/crew experiences) - he has been able to build on the foundation that he knew in his heart had been there since grade school. Rent presented by the New Repertory Theatre runs through September 25, 2011 at the Arsenal Center for the Arts, Charles Mosesian Theater, 321 Arsenal Street, Watertown, MA 02472. Tickets range from $28 - $63. For more information or to purchase tickets, please visit the New Rep website.